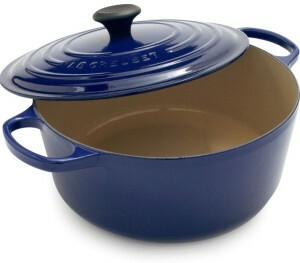 If you’ve taken any interest in cookware, then you probably already heard the name Le Creuset. Even if you haven’t, no doubt you’ve spotted the bold colors on their enameled cast iron cookware. 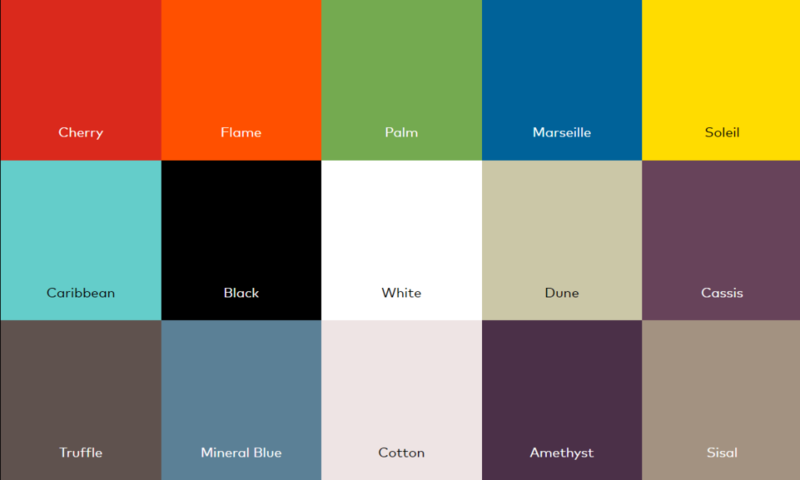 These beautiful colors are more than enough to get anyone’s attention, but Le Creuset is much more than just good looks. The company has a long history of producing quality cast iron, stainless steel, and stoneware tools for the entire kitchen. And it’s this reputation that has made them one of the most sought-after brands in the world. 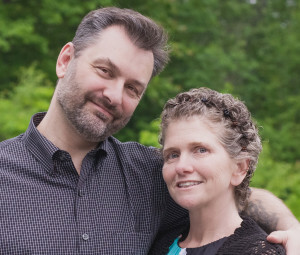 Perhaps one of the most noticeable things that shows Le Creuset’s dedication to quality products and customer care is their Care and Use page. This is a solid reference that explains everything you need to know about caring for your Le Creuset cookware, from the time you first take it out of the box. We suggest that you refer to it as often as possible to ensure that your cookware lasts generations. Le Creuset’s line of enameled cast iron cookware has become the world’s standard for nearly a century. The vibrant colors are a joy to look upon, but that’s just the beginning. Each cast iron piece is individually cast in a sand mold, and then inspected by experts to ensure the highest in hand-crafted standards. Since cast iron cookware is heavy when compared to other materials, Le Creuset has taken steps to ensure that every handle and knob is easy to lift, hold, and carry, even with pot holders. This makes them easy to transfer from stove top, to oven, to table with ease. The distinguishing feature for this line is the enamel. The outer layer of enamel comes in a variety of colors, a handful of which are “exclusive.” It is chip and crack resistant. 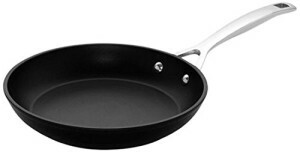 The inner layer is a neutral sand color (except for signature skillets and a few other pieces) that encourages caramelization and is stick resistant. The Signature Skillets are slightly different, in that they have a satin black cooking surface that does not require any seasoning. Furthermore, the surface is designed to withstand high-temperature cooking. You could cook on a campfire with this skillet, though we’d recommend something a little less expensive when trekking out in the woods. All of these cast iron pieces can withstand temperatures up to 500 degrees. They can be used on any type of heat source and still heat slowly and evenly, and retain the heat in the way that has endeared people to cast iron for generations. They are also dishwasher safe, though the dishwasher can fade the enamel over time. Finally, Le Creuset backs up their cast iron with a Lifetime Warranty. While not as well-known as the enameled cast iron, Le Creuset’s Stainless Steel line stands on its own as a set of premium cookware. These pieces are constructed of three layers. The core is a full layer of aluminum that distributes heat evenly, with no hot spots. The outer layer is a magnetic stainless steel of a titanium alloy that has a mirror-like shine that resists scorch marks and discoloration. The inner layer is surgical-grade stainless steel. 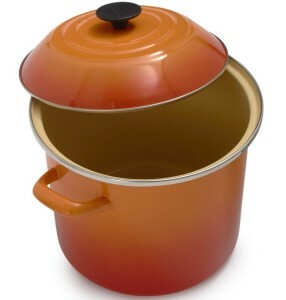 Le Creuset Stainless Steel pieces come with a patented handle that stays cool to the touch. The rims are flared, which allows for even, drip-free pouring. And, as an added bonus, the interior of the pans is laser-etched with measurement markings, so you always know how much you have inside. The lids, which are just a shiny as the main pieces, are designed to fit snugly along the rim. The lids also have relief valves that prevent the mess of boil-overs. Le Creuset Stainless Steel cookware designed to work best on induction cooktops, though they can be used on any cook top, or in the oven. They can withstand temperatures up to 500 degrees, and are dishwasher safe. In fact, they only dishwasher problem Le Creuset mentions with the Stainless Steel line is that some detergents may cause a slight discoloration. If this occurs, they recommend trying a different one. 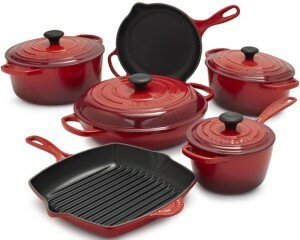 Le Creuset’s line of Toughened Nonstick cookware is made of hard-anodized aluminum. They also have a magnetized stainless steel bottom, so they are good to go on any cooktop. What really sets this line of cookware apart from the others is the nonstick surface. 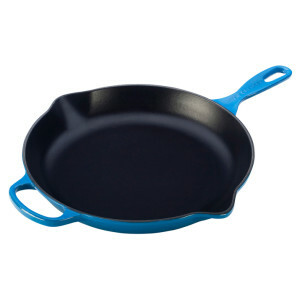 Le Creuset’s nonstick surface is a seamless, triple-layer coating that is hot-forged. This process ensures that the coating will never chip or flake while you are using it. The coating is PFOA-free, so it is also safe for your health and the environment. 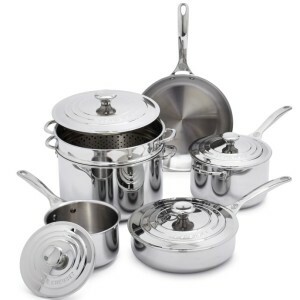 This is the set of cookware that you want for cooking a wide range of foods, especially the ones that have a tendency to stick to the pan. Make omelet after omelet without ever having to scrub anything off. The patented stainless-steel handles are hollow, so they stay cool to the touch, and the rivets never let go. The pans are oven safe up to 500 degrees (which is really saying something for a nonstick pan), and the surface itself can even withstand metal utensils (but if you care about your pans, don’t use them). As far as the dishwasher goes, Le Creuset says that they are completely safe in that harsh environment. Can’t say that we’d ever condone putting nonstick in a dishwasher, so that one’s on you. With Le Creuset’s Enamel on Steel line of cookware, you get the best of their carbon steel cookware with their amazing pallet of colors used for their cast iron cookware. Unfortunately, this line is limited to stockpots and tea kettles. Still, there are a few things to say about this line. The enamel is porcelain and chip resistant, and the bottoms are magnetized, so they are induction ready. Expect the same type of heating that you would get with the Stainless Steel line. Also, the tea kettles have a harmonic whistle and heat resistant handles. They not only look great on the stove, but they are practical, too. While not for the cooktop, Le Creuset Stoneware still bears mention because these pieces of bakeware are the perfect complement to their Enameled Cast Iron. 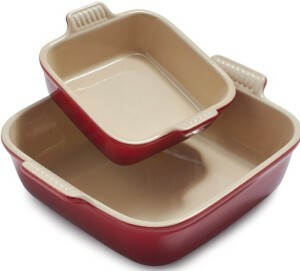 In fact, a set of cookware isn’t complete without items such as casserole dishes or matching dinnerware. Le Creuset’s stoneware is covered with a beautiful enamel glaze that stands up against wear, heat, and time. It is resistant to scratches and stains that often mar the classic look of stoneware. The inner layer is nearly nonstick, so it will release foods with ease and require little effort to clean.